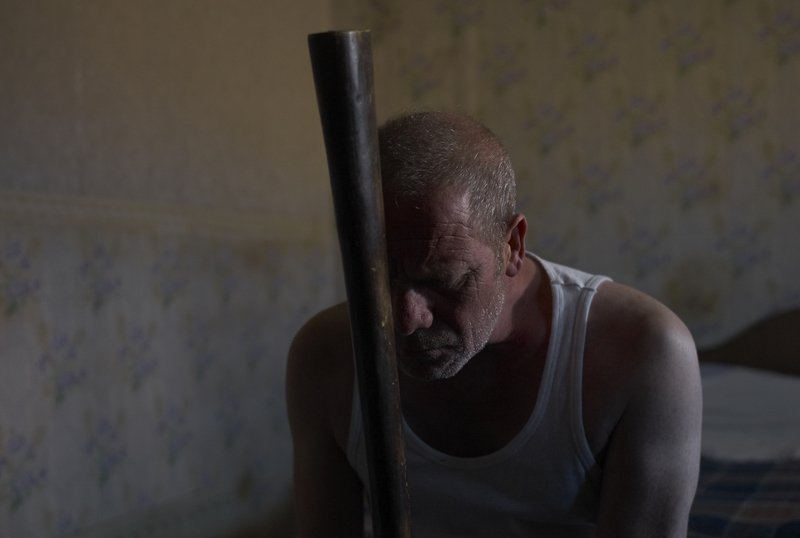 Tyrannosaur is Paddy Considine’s feature debut as writer/director, following Joseph (Peter Mullan): an ageing and conflicted man, plagued by his own actions. Prone to acts of instinctive violence he is shown to suffer repercussions in both trials of remorse as well as the revenge of his victims. After a bout of this circulative aggression, Joseph takes refuge in a charity shop where Christian-minded Hannah (Olivia Colman) offers her prayers. Accused of leading a life ignorant to the hardship endured by the working class, a new dimension of suffering unfurls. An extension of Considine’s 16 minute short ‘Dog Altogether’ – a phrase which appears in the feature as a comment on an unforgiving society from a troubled friend of Joseph – the same characters are explored by the same nuanced performers but within the broadened context of the society that harbours them. The respective stories of Joseph and Hannah are given a scope which allows the characters, and the audience, to reflect; attaching a contemplative pace to the film that is aided by a melancholic, acoustic score. The cast of Tyrannosaur bring a frightening reality to abusive and abused personalities. Known for her comedic roles, such as those in Peep Show or even alongside Considine himself in Hot Fuzz (2007), Colman flourishes in executing moments that evoke laughter and a light-hearted relief amongst her outstanding dramatic performance. It is as though her comic exposure amplifies the tragedy of Hannah – in seeing a capability that has been ever absent from her most familiar appearances on screen. An impact similar to comedienne Mo’Nique’s Academy Award winning role in Precious (2009). Peter Mullan’s Joseph is hauntingly believable: cultivating an air of unpredictability, similar to James (a harrowing Eddie Marsan), the tension becomes almost palpable. However, Joseph is conflicted by his late-blooming maturity which conveys a certain depth that makes him all the more recognisable.Since the death of his wife, his companionship has been fulfilled by a dog, a symbol of loyalty that reoccurs throughout the film. His catatonic, almost bipolar, dips into aggression and reflective sorrow are one example of an acknowledged hypocrisy and tainted moral code: fittingly he states “I’m no Samaritan” and calls out the notion of ‘naïve faith’ resonating not only with Hannah but his own canine companion. Tyrannosaur provides a host of characters that are not plainly good or evil, although a few definitely belong to the latter category. In spite of their flaws, redeeming qualities are offered which complicates the process of empathy. Tommy, the appropriator of the term ‘dog altogether’, is introduced as a clan-rallying racist who turns out to be a gentleman for a damsel in distress. While the film is far from ‘feel-good’ and sometimes hard to watch, it is delivered with an honesty and realism that begs attention. Dark in subject matter Tyrannosaur is a hauntingly powerful depiction of abuse and retribution. You should see this film. No excuses.